The Mariners hired the first Asian-American manager in Major League Baseball history. Don Wakamatsu was formerly the Oakland A's bench coach. 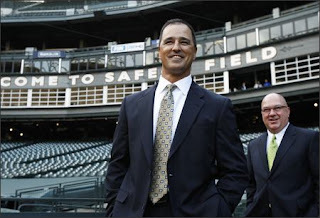 Of course the Mariners hired the first Asian-American manager! They're owned (at least partially) by Nintendo, headed by a Japanese billionaire, and have the biggest of all Japanese baseball stars on their team in Ichiro. Except that Don Wakamatsu doesn't speak more than a few words of Japanese. He's 4th generation Japanese-American. His father was born in an internment camp during WWII. Really, you can't get any more American than that, in a strange f-ed up way. Which is great. Us white folk often assume if you're not white you must have come over more recently than we did. Not true! Not true. Anyway, you can tell it's been a long week and I'm tired as I've completely forgotten whatever point I originally set out to make by posting this. That is one tall Asian!